Source: PureAire Monitorings Systems, Inc.
PureAire Monitoring Systems offers an explosion-proof monitoring system for the detection and measurement of carbon monoxide (CO), hydrogen (H2), ethylene oxide (EtO), and other hazardous gases. PureAire Monitoring Systems offers an explosion-proof monitoring system for the detection and measurement of carbon monoxide (CO), hydrogen (H2), ethylene oxide (EtO), and other hazardous gases. Designed specifically for use in Class I, Division 1, Group B, C, and D hazardous areas, the TX-KP Monitoring System is ideal for leak detection and surveillance in chemical plants, refineries, and other locations where explosive or flammable gases may be present. Standard features on the system include digital or analog display, renewable or disposable plug-in sensor, and one-man remote calibration. For installation versatility, the signal from the monitor may be routed to either independent alarm, control, or surveillance systems or its own optional dedicated controller. 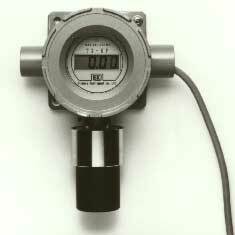 Other gases detectable with the system include H2S, SO2, propylene, acetone, ethylene, fluorine, and bromine. PureAire Monitoring Systems, Inc., Ste. 57, 5420 Newport Dr., Rolling Meadows, IL 60008. Tel: 847-788-8000. Fax: 847-788-8080.